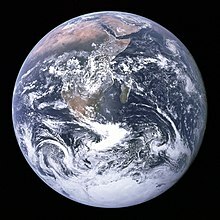 From Middle English erthe, from Old English eorþe (“earth; Earth”), from Proto-Germanic *erþō (“earth”), from Proto-Indo-European *h₁er- (“earth”). More at earth. The third planet of the Solar System; the world upon which humans live. It's my theory that we'll keep being reborn on as many Earths as it takes until every person gets it exactly right from the moment they are born until the moment they die. For quotations of use of this term, see Citations:Earth. The personification of the Earth or earth, (chiefly) as a fertile woman or (religion) goddess.